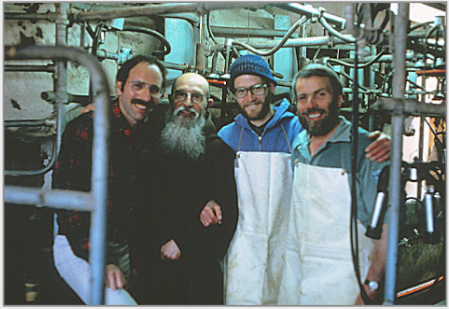 Stanley Roseman (left), Frère Élie, Frère Michel, and Frère Samuel (right), manager of the dairy farm at the Abbey of La Trappe, Normandy, spring 1979. 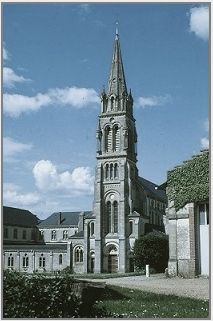 Stanley Roseman and Ronald Davis made their first sojourn at the Abbey of La Trappe, in Normandy, in early June 1979. La Trappe gives its name to the branch of Cistercian monasticism that developed from a seventeenth-century spiritual movement of rigorous asceticism centered at the Abbey. In the late nineteenth century, the growing number of monasteries that followed the Trappist regime joined together to form a separate order which acquired the name Order of Cistercians of the Strict Observance, also known as the Trappist Order. "The warm welcome and gracious hospitality we received from Abbot Gérard Dubois and the Community and the great encouragement given Ronald and me in our work meant very much to us," writes Roseman, who was brought inside the cloister to draw the monks. Presented below, (fig. 2), is a portrait drawing of Brother Samuel. After the Trappist monk's morning work on the farm, he thoughtfully sat for the artist in the scriptorium. In this impressive portrait Frère Samuel, vigorous strokes of black and bistre chalks delineate the monk's strong, facial features. The beige paper imbues the composition with a warm tonality. 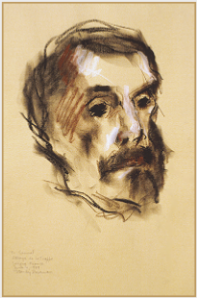 Passages of black chalk describe the monk's dark hair, moustache, and beard, and accents of white chalk add heightening to the skin tones. Roseman has effectively expressed an asceticism in the portrait of Frère Samuel, who had dedicated years of manual labor on the Abbey's large dairy farm as well as having maintained the rigorous regime of the Trappist Order. Frère Samuel thoughtfully brought Roseman and his colleague Ronald Davis on a tour of the abbey farm, following which Davis took the photograph presented here of the artist and the Trappists. Abbot Gérard asked Roseman if he would give a talk on his work to the Community and show slides that Davis had brought with them of the artist's paintings and drawings on a variety of subjects. Roseman had been asked to speak about his work in a number of monasteries where he and Davis had sojourned. The artist writes in his journal: "Abbot Gérard thoughtfully rearranged the daily schedule. After Mass, the monks gathered in a room where seats and a slide projector and screen had been provided for the occasion. Ronald and I had selected drawings to show from the preceding days' work. As I did not speak French fluently, I spoke in English and Frère Élie kindly translated my talk to the Community." Roseman spoke about drawing at opera, theatre, and dance productions in the United States and drawing and painting portraits of the clowns at the Ringling Bros. and Barnum & Bailey Circus. The artist showed slides of work that comprised the exhibition Stanley Roseman - the Performing Arts in America, produced by Davis for the American bicentennial. Roseman spoke about traveling with Davis in 1976 to Lappland, where the artist painted portraits of the nomadic Saami people, and the exhibition the following year at the Peabody Museum, Yale University. The artist's slide presentation and talk concluded with his current work on the monastic life. 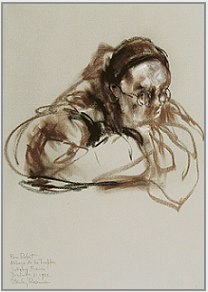 During the 1980's, Roseman was much engaged in writing a text to accompany his paintings and drawings on the monastic life. In Roseman's return to La Trappe, Abbot Gérard thoughtfully made the library available to the artist for his ongoing research and study, and several monks kindly assisted him with information on the Abbey and on Trappist monasticism. "The Abbey of La Trappe, in the Department of the Orne, in Normandy, traces its history from 1122, at a place called La Trappe where a chapel was built by Comte Rotrou III du Perche in memory of his deceased wife Mathilde, granddaughter of William the Conqueror. In 1140, monks from the nearby Abbey of Breuil-Benoît, in the Benedictine Congregation of Savigny, began a monastic community at La Trappe. Seven years later, during a century of great expansion of Cistercian monasticism throughout Europe, the Congregation of Savigny joined the Cistercian Order, which dates from the founding of the Abbey of Cîteaux, in Burgundy, in 1098. "Armand-Jean Le Bouthillier de Rancé, born in 1626 of an aristocratic family, pursued an ecclesiastical career as his family had intended for him. However, in his thirties, Rancé felt a calling to the contemplative life. 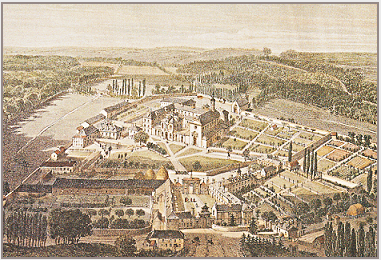 After a few years of reflection, which included a visit to La Trappe in the summer of 1658, he divested himself of his properties and benefices; received royal permission to transfer his hereditary title of commendatory abbot of La Trappe to that of regular abbot; entered the novitiate at the Abbey of Perseigne, near Alençon; and, after a year, made his monastic profession. In 1664, Rancé returned to La Trappe. "Inspired by accounts of early monastic life in the deserts of Egypt and Syria, Abbot Rancé established a rigorous spiritual asceticism at La Trappe. The monks devoted long hours to personal prayer and meditation, in addition to the communal worship in choir; maintained an abstemious diet with fasting; and practiced self-denial; penance; and strict silence. 3. The Abbey of La Trappe from an eighteenth-century engraving. 4. The present-day abbey church, built in the nineteenth century. In Roseman's text, from which are excerpts below, the artist speaks about the history of the Abbey of La Trappe and the establishment of the Trappist Order. Roseman and Davis, who had kept in correspondence with the monastery through Frère Élie, received a cordial letter from their friend in autumn of 1982: The monk writes: "I read with pleasure that you intend to visit La Trappe again in the near future. All of us will welcome you heartily and in the meantime send you our very best wishes. Affectionately, Frère Élie." 1982 brought Roseman and Davis to monasteries in Switzerland, in February and March; Italy, in June; and Sweden, Denmark, and the Netherlands, in July. In August and later that year, in November and early December, the artist and his colleague returned to monasteries in Germany. "The Lives of the Desert Fathers (Historia Monachorum in Aegypto), a fourth-century contemporary account of Christian monks and hermits living in the Egyptian desert, records the vigils kept by those pious men. 6. Title page of the Book of Psalms. 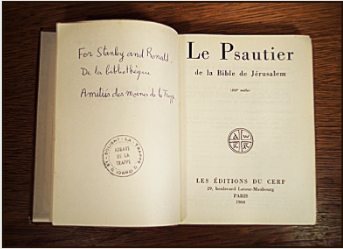 A gift copy of the Book of Psalms given in friendship from the monks of the Abbey of La Trappe to Stanley Roseman, of the Jewish faith; and Ronald Davis, of the Roman Catholic faith. In the photograph, the Trappist monk is showing the artist the sign for the word "bread." "The introduction of a fixed system of gestural language is credited by scholars to the Abbey of Cluny, in Burgundy, under the Benedictine monastery's second abbot, St. Odo (926-942). A century later, several monks compiled lists of signs, as did Bernard of Cluny, who in 1068 enumerated 296 signs. Udalricus, also a monk of Cluny, compiled a list of signs of which many show similarities to the sign language that later developed in Cistercian monasteries. By way of example is the sign for 'bread,' which is indicated by touching the tips of the forefingers and thumbs of both hands in a triangular configuration. . . .", (fig. 8). "The Rule of St. Benedict, Chapter 48, entitled 'The Daily Manual Labor,' instructs that the monks be engaged in work during prescribed times of the day as a balance to the hours devoted to prayer. 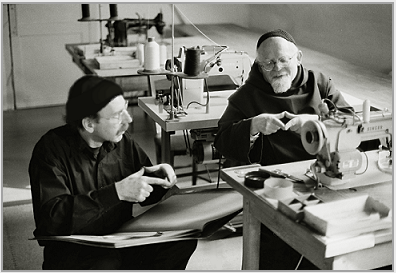 Trappists emphasize manual labor in their interpretation of the monastic precept ora et labora, prayer and work. "In my reading and study on the monastic life,'' the artist recounts, "I learned that the Night Office observed in monasteries today has an ancient precedent in Judeo-Christian early monastic traditions in the Middle East. The desert settlement of Qumran, near the Dead Sea, was a center of monastic life in Judaism from the second century BC to the first century AD. The Dead Sea Scrolls include the Rule of the Community and accompanying texts that relate the communal life at Qumran: adherence to obedience, celibacy, and self-denial, the ritual of the common meal taken in silence, the daily round of worship with singing the Psalms, and the lengthy vigil in the night. "The Therapeutae, the subject of Philo of Alexandria's treatise The Contemplative Life, were Jewish eremites contemporary with the Qumran community. The Therapeutae, whose main settlement was near Alexandria, lived in solitude in hermitages and observed a strict regime of prayer and reading and studying the Holy Scriptures. On the Sabbath the hermits met in a sanctuary for a sermon given by an elder. Every seven weeks, as seven was regarded as a sacred number, the hermits assembled for a discourse and common meal followed by a vigil with prayers and singing until dawn. Amitiés des moines de La Trappe." Since early Christian monasticism, silence has been an essential element in a life of contemplation and prayer. Roseman writes: "The Lives of the Desert Fathers makes repeated mention of fourth-century monks' asceticism and discipline of keeping silent. The Rule of St. Benedict, Chapter 6, extols the virtues of silence. St. Benedict states: 'For speaking and teaching belong to the master; the disciple's part is to be silent and to listen.' Benedict prescribes a rule of silence in the refectory when the monks take their meals while they listen to the weekly reader, (Chapter 36); and after Compline, when strict silence is required until morning, (Chapter 42)." Recounting his return to the Abbey of La Trappe in December 1982, Roseman writes: "As was my custom for drawing at Vigils in monasteries, I prepared my folios of drawing paper and box of chalks before I went to bed and set my alarm clock. At La Trappe, I rose at 3:15 A.M., washed, dressed - and being that it was December in Normandy - put on my parka, gathered my drawing materials, and went to the church. "Devote yourself often to prayer,'' instructs St. Benedict in Chapter 4 of his Rule. In addition to the communal worship at the Divine Office, Trappist monks are required to devote extensive time to personal prayer. "I thank you again for your good wishes and for the drawings that you have generously given us. "I took a seat in one of the pews, opened my drawing book and box of chalks, selected a stick of chalk, and began drawing. In the dimly lit church, several monks stood or knelt in side chapels, others came to sit or kneel in the pews or choir stalls to pray and meditate. Despite the cold, it was inspiring to be there in the night with the monks, whose encouragement of my work on the monastic life meant very much to me. On the morning of December 14th, Roseman and Davis departed St. Stephan's Abbey, in Augsburg, for the more than a thousand kilometer drive to the Abbey of La Trappe. En route they encountered a snowstorm which prolonged their journey. They stopped several times along the way to call Frère Élie at the gatehouse to report their progress and to express their concern that they would be unable to arrive before Compline. As Roseman recounts: "Frère Élie cautioned us to drive slowly and carefully in the snowstorm and kindly assured us that he would be at the gatehouse to receive us at whatever hour we arrive. He also told us that Frère Marc said he would wait up for us to bring us to our rooms and see us settled in." When Roseman and Davis arrived at La Trappe about 10 P.M., Frère Élie opened the gates and heartily welcomed his friends. Roseman relates: "Frère Marc, a kind and caring guestmaster, had supper ready for us. I thanked him very much for his gracious hospitality. I said what I had said to Frère Élie - that Ronald and I were very happy to be back and how much I was looking forward to resuming my work. Frère Marc thoughtfully told me that the church was cold and to dress warmly, especially when I draw at the long Night Office." In the present work, subdued white highlights on Frère Marc's face, eyeglasses, and forehead and the mise en page emphasizing perspective bring the figure forward in pictorial space. The Trappist monk humbly stands with his head inclined and eyes lowered. His confrere in choir, drawn in fluent lines and transparent tones of bistre chalk, leans forward, his right arm raised and his head upturned towards the altar. In this compelling composition, Roseman beautifully expresses the individuality of the two Trappist monks, each absorbed in prayer at the Night Office. Frère Marc, the ascetic, bearded guestmaster, stands in the foreground of the superb drawing Two Trappist Monks at Vigils, 1982, (fig. 5). The monks wear voluminous, thick, woolen cowls with long sleeves that cover their arms and hands. The predominant use of bistre chalk, blended tonal passages of bistre and black chalks, and reserved areas of the gray paper imbue the drawing with a nocturnal quality, as in the related drawing from the artist's sojourn that December at the Abbey of La Trappe, Père Robert at Vigils, in the collection of the Albertina, Vienna, (fig. 7, below). Roseman's drawings at the Night Office, or Vigils, comprise an important part of his work in the monasteries. 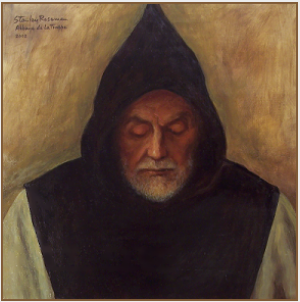 "In my studies," Roseman further relates, "I read that in fourth-century Egypt St. Pachomius (293-346), revered as the founder of cenobitic Christian monasticism, specifies in his Rule that signs be used at certain times to preserve the silence that is essential to monastic life. Père Robert at Vigils, 1982, (fig. 7), is also presented at the top of the preceding page "Cistercians and Trappists.'' This excellent drawing was acquired by the Graphische Sammlung Albertina, Vienna, containing a world-renowned collection of master drawings, and included in the Museum's exhibition in 1983 of Roseman's drawings. (See website page "Exhibition at the Albertina." In this intimate portrait, calligraphic strokes and tonal passages of bistre chalk establish a pyramidal composition in the depiction of the figure. A complementary geometric leitmotif of circular shapes and forms defines the monk's round face, round-rimmed eyeglasses, skullcap, and voluminous sleeves. Père Robert leans forward, his arms rest on the back of a pew, his hands tucked into the sleeves of his cowl. The rendering of light and shade in blended tones, or sfumato, of bistre and black chalks with subdued white highlights and the reserved areas of gray paper give the drawing a nocturnal ambiance. Roseman conveys a deep spirituality of the Trappist monk in prayer and meditation in the night. Presented here, (fig. 9), is a deeply felt portrait of Frère Samuel in prayer. In this dramatic composition, the face of the white-bearded Trappist monk, whose eyes are lowered in prayer, is encircled by the black hood of his scapular. Roseman has expressed the intense spirituality of Frère Samuel in this masterly rendered oil on canvas portrait. "The historic changes that resulted from the Second Vatican Council included reforms to the strict use of sign language in Trappist monasteries and took into consideration the human need for moderate, verbal communication within the context of monastic life. Roseman also drew Père Robert in the tailor shop, where as the artist recounts: "An immediate rapport was established between us when I mentioned to Père Robert that my paternal grandfather was a tailor in New York City." "After the last Psalms were sung; the Psalters, closed; and the candles on the altar, extinguished, the monks remained for an additional half hour for personal prayer and meditation in the darkened church. Some of the monks dispersed from choir to the side chapels, while others went to sit on the benches in the rear of the church or in the pews. I closed my drawing book and box of chalks, placed them by my side, and like the monks, I immersed myself in meditation and prayer." Frère Samuel, seen in the photograph at the top of the page and in the portrait from 1979, (fig. 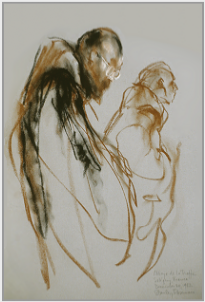 2), is the subject of Roseman's drawings created over the years at the Divine Office and on occasions when the artist accompanied his friend back to choir to draw him in personal prayer and meditation. The friendship between the Trappist monk and the artist, which began in the first year Roseman drew at La Trappe, was especially meaningful: Roseman was to learn that Frère Samuel's family in Normandy had been close friends with a Jewish family. During the Second World War, Frère Samuel's father, a medical doctor, brought the Jewish family into his home and gave them refuge during the Occupation. The Bibliothèque Nationale de France commends Roseman for his "innate artistic talent"
2. L. Aubry, Abbaye de La Trappe, (Rouen: C.R.D.P, 1979), pp. 3, 4, 5. 3. L'Abbaye Notre Dame de la Grande-Trappe, authored anonymously by a monk of La Trappe (Orne: Montligeon, 1926), pp. 65, 76, 78. 4. Louis J. Lekai, The Cistercians, (Ohio: Kent State University Press, 1977), pp. 188, 189. 5. Psalm 119 in the Hebrew Bible is numbered Psalm 118 in the Vulgate. 6. Geza Vermes, The Complete Dead Sea Scrolls in English, (Harmondsworth, England: Penguin Books, 1962), The Community Rule, pp. 97-123. 7. Philo of Alexandria, The Contemplative Life and selected writings, translation by David Winston, (Paulist Press, New York, 1981), pp. 41-57. 8. The Lives of the Desert Fathers, translated by Norman Russell, (Oxford: Mowbray, and Michigan: Cistercian Studies, 1980), pp. 111, 112, 134. 9. Psalm 51 in the Hebrew Bible is numbered Psalm 50 in the Vulgate. The Rule of St. Benedict uses the Vulgate Bible numbering of the Psalms. 10. The Lives of the Desert Fathers, pp. 3, 65, 106, 114, 115, 149, 155. 11. Robert A. Barakat, Cistercian Sign Language, (Kalamazoo, Michigan: Cistercian Publications, 1975), p. 24. 12. Lekai, The Cistercians, pp. 372, 373. 13. Barakat, Cistercian Sign Language, p. 25. 14. Stanley Roseman - Dessins sur la Danse à l'Opéra de Paris, (text in French and English) (Paris: Bibliothèque Nationale de France, 1996), p. 11.